As of today I am 10 days refined sugar free! 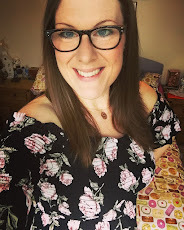 I've pledged to have a #SugarFreeSeptember with the hope that it will speed up/boost my weight loss, reduce my sugar cravings, stabilise my blood sugar, and encourage me to discover some new, exciting, healthy recipes. So far I'm feeling GOOD - no headaches or withdrawal from the lack of refined sugar as of yet, and my mood seems stable (I'm no grumpier than usual, tee hee!). This is reassuring as I'd read loads of horror stories about how awful I would feel for the first few days/weeks of no refined sugar. I have realised that I generally don't eat masses of sugar that often day to day anyway- hence the lack of horrible side effects, phew! I've discovered a few really tasty new dinner recipes over the past ten days, but, by far my favourite discovery are these THREE INGREDIENT (yes, really!) refined sugar free brownies. I've been doing lots of nutritional research about a refined sugar free diet and during my research I found various people talking about baking blended bananas with cocoa/cacao powder and organic peanut butter, and how it creates a fudgy/truffley textured "cake" - I was sceptical to say the least - so I had to test it, and I am amazed. It worked. 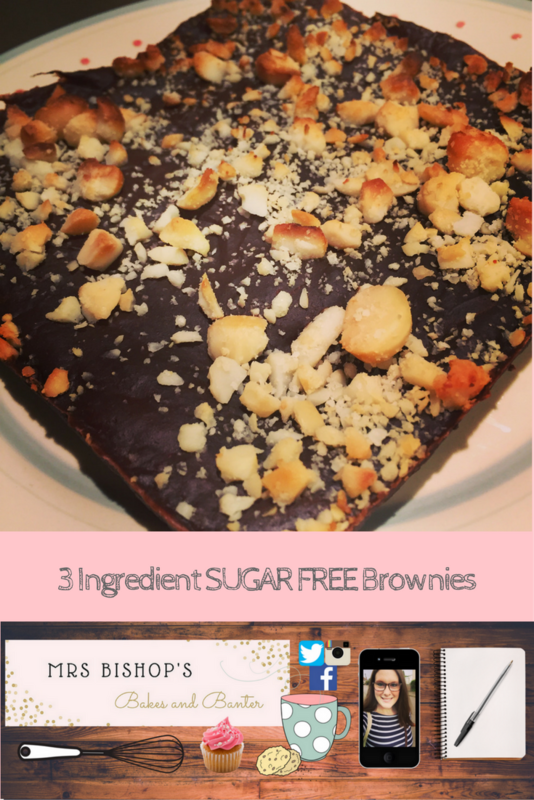 Not only did it work but it created a really yummy, healthy alternative to a sugar-laden 'proper' brownie. 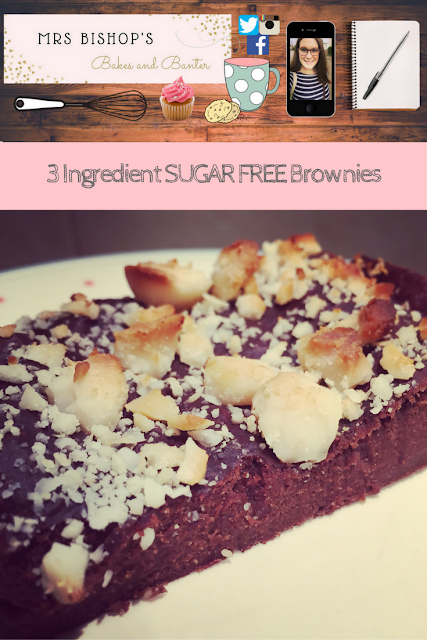 Don't get me wrong, it ISN'T a substitute for a full-on brownie: a little of what you fancy does you good after all, but it is a really tasty sweet morsel which will help to curb sugar cravings, while keeping your blood sugar stable. Perfect for those on a sugar-free diet, for people trying to lose weight or generally health-conscious people who don't want to eat all-the-crap. If you could replace some of your sugar-laden "treats" (I hate that term) with these brownies then you'd be making a very positive diet choice, and would greatly reduce your calorie intake - as well as filling your body with "good calories" - as not all calories are equal as we know. Blitz all the brownie ingredients in a food processor until a smooth batter forms. Add any additional ingredients you choose, or simply leave them plain. Pour into a brownie tin lined with buttered/greased baking paper. Top with any extras, I sprinkled over bashed up macadamia nuts. Leave to cool for 10 minutes and then remove from tin and slice into 6 slabs. approximately 200 calories per brownie. Store your brownies in an air-tight container in the fridge (they are also lovely fridge-cold! ), or freeze on the day you make them. Please let me know how you get on if you give these a make. 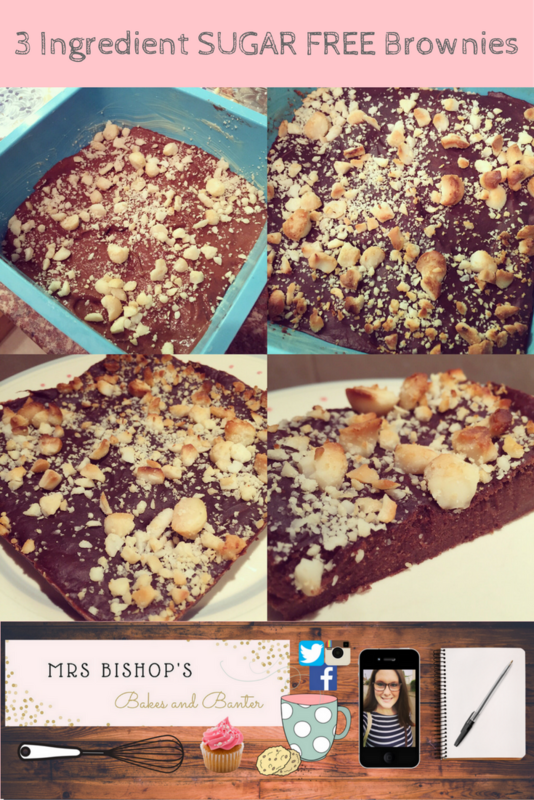 Tag your pictures on social media with #MrsBishopsSFBrownies as I'd love to see your sugar-free masterpieces. Happy sugar-free baking my lovelies!